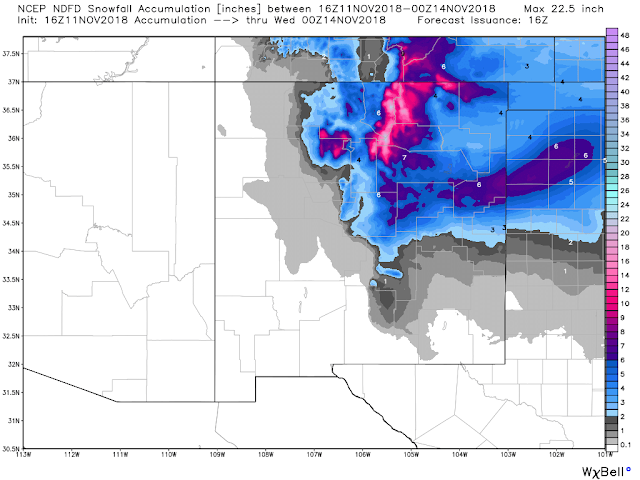 Winter Storm Headed Our Way! Sierra Blanca Peak West Of Ruidoso, New Mexico. 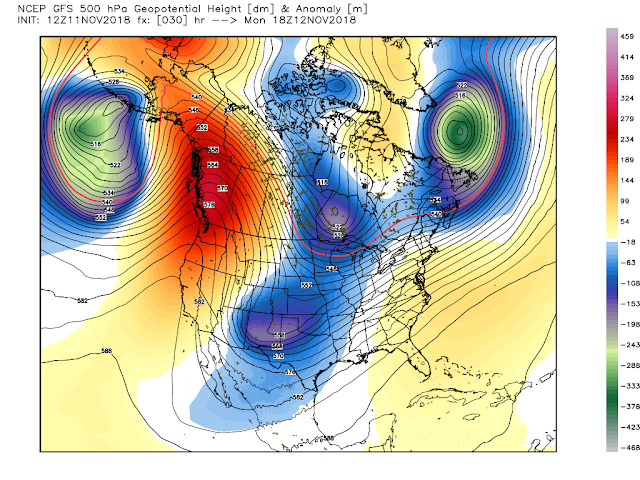 Quick Hitting But Complex Winter Storm. U.S. GFS 500 MB (18,000' MSL) Analysis. 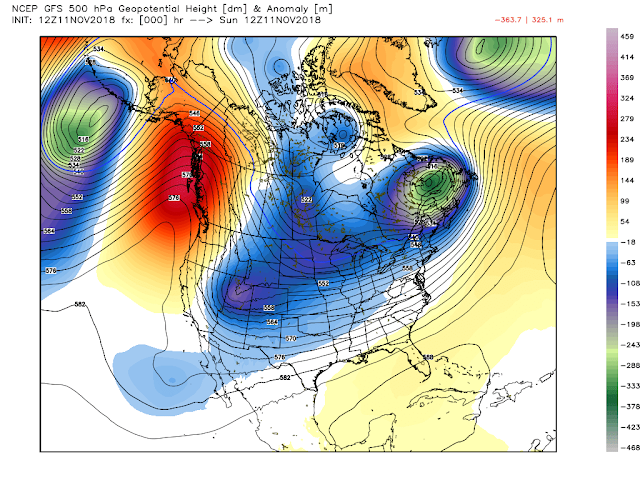 Valid At 5 AM MST Sunday Morning. 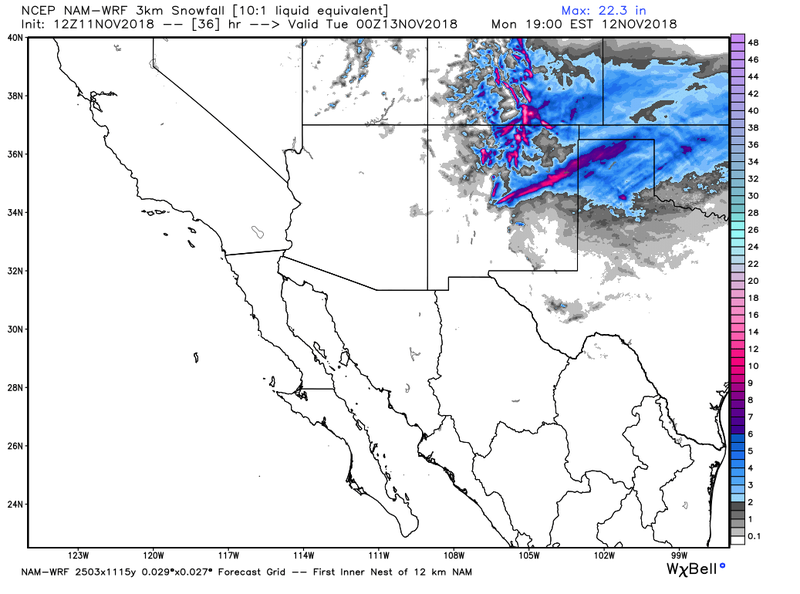 Valid At 11 AM MST Monday. As the sun was rising this morning we find that our next winter storm was centered near west-central Utah as view from the 500 millibar chart. Or looking at the mid-level of the atmosphere at about 18,000' up. This mornings run of this model digs it southeastward to about the Tucumcari area by around noontime Monday. It appears to be forecasting a more of a slightly closed look to the short wave trough and further back west than previous runs. It will be interesting to see what the European model has to say later this morning on the position of the storm. My gut feeling is that this incoming winter storm like our last one will dig further south and west than the models are forecasting. Which will impact how much snow falls and where over the area. 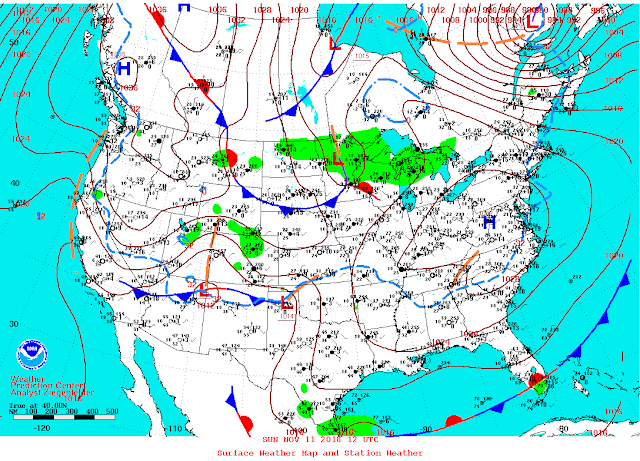 Strong Surface Cold Front Moving South. Valid At 5 AM MST This Sunday Morning. 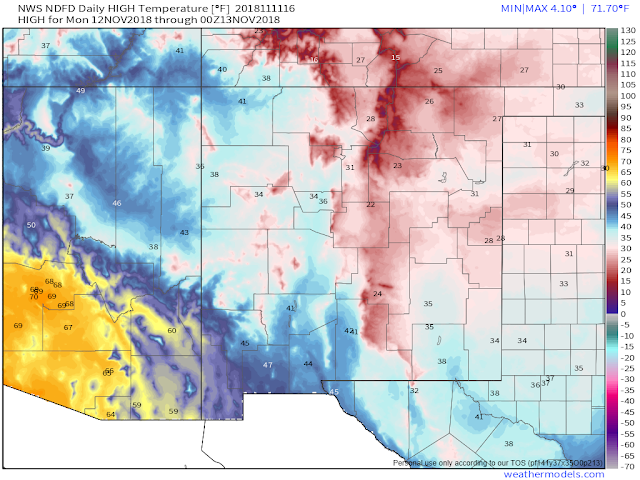 Valid At 5 PM MST This Sunday Afternoon. At the surface a strong cold front was draped across northern Arizona eastward to northern New Mexico and the Texas Panhandle at sunrise this morning. 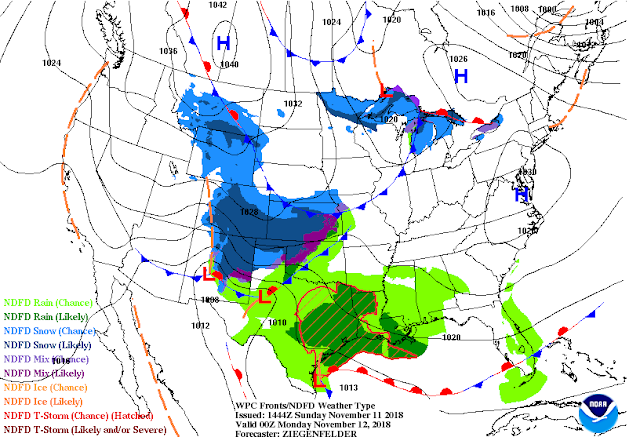 This front will surge southward today and arrive in Southeastern New Mexico and nearby West Texas by around sunset. Northerly and northeasterly winds gusting up to 25-40 mph tonight into Monday morning will make for a raw day indeed. Wind chill values will certainly make it feel much colder than what the thermometer tells us. Single digit values are forecast for the Guadalupe, Sacramento, and Capitan Mountains with the teens across the Southeastern Plains. 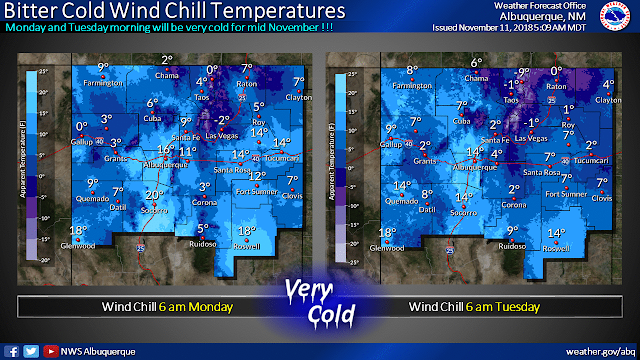 The Clovis and Portales areas will see wind chill values tonight into Monday morning dip into the single digits. NWS NDFD Forecast Hit Temps Today. NWS NDFD Forecast High Temp Anomalies Today. 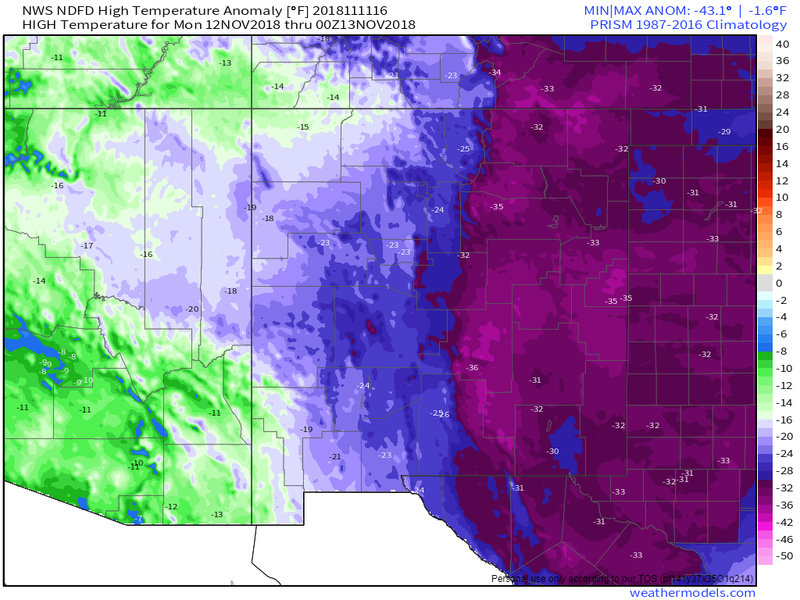 NWS NDFD Forecast Hit Temps Monday. NWS NDFD Forecast High Temp Anomalies Monday. After seeing our daytime high temperatures climb up into the low 70's today in Carlsbad and the mid 60's in Roswell Monday's highs will struggle to make it above the mid 20's and 30's. Our highs today will be near normal for the date. Monday's highs will be some 30º to 35º below normal for the date. Consider that Roswell's record high temp for today (Sunday) is 84º set in 1956. On this date in 1907 they only reached a high of 32º for the coldest high temp for November 12th. And in 1950 they dropped down to 10º on November 11th. Roswell measured 1.8" of snowfall on November 12th, 1976. NWS NDFD Low Temperature Forecast Tuesday Morning. Current National Weather Service NDFD forecasts call for the coldest morning of the season most of the area Tuesday morning. Low temperatures in the Sacramento Mountains will drop down into the single digits and teens Tuesday morning. 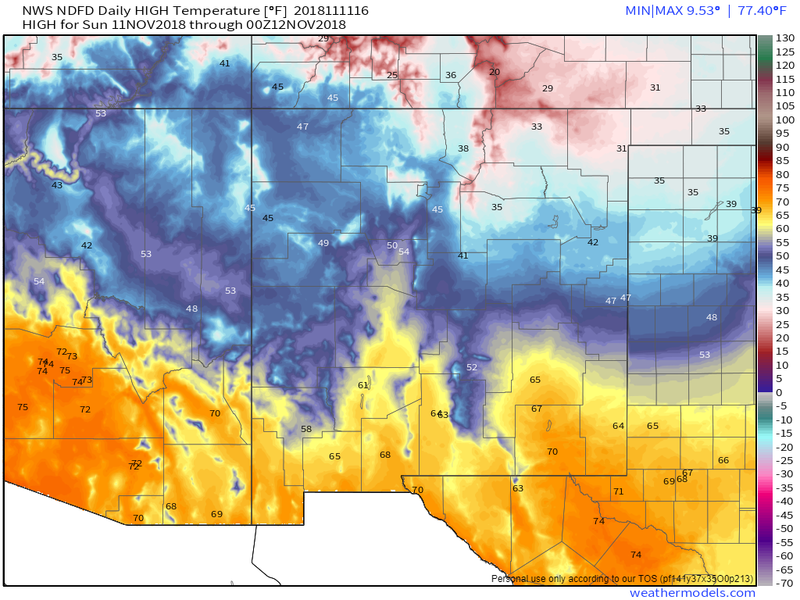 The teens and low 20's are forecast for the Southeastern Plains. 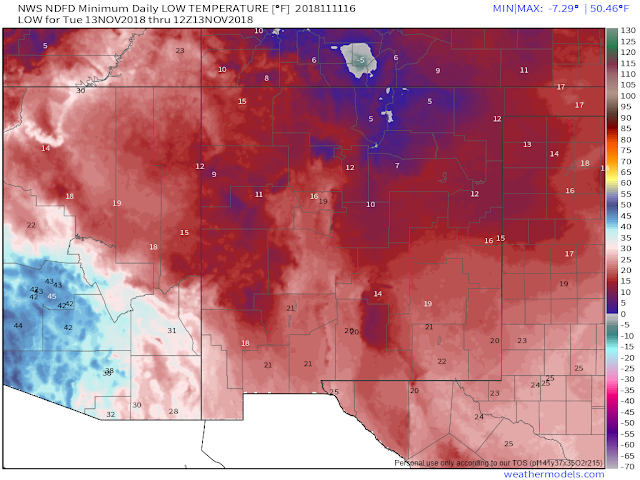 Saturday morning just about everyone in the Pecos Valley except those of us who live in and near the Carlsbad area experienced a light freeze. Tuesday's morning lows will constitute the first hard freeze of the season so expect our trees to undergo a massive leaf dump this week. Meaning that many of them in the plains have yet to turn their fall colors and will simply freeze, die, and fall off the trees over the next few days. 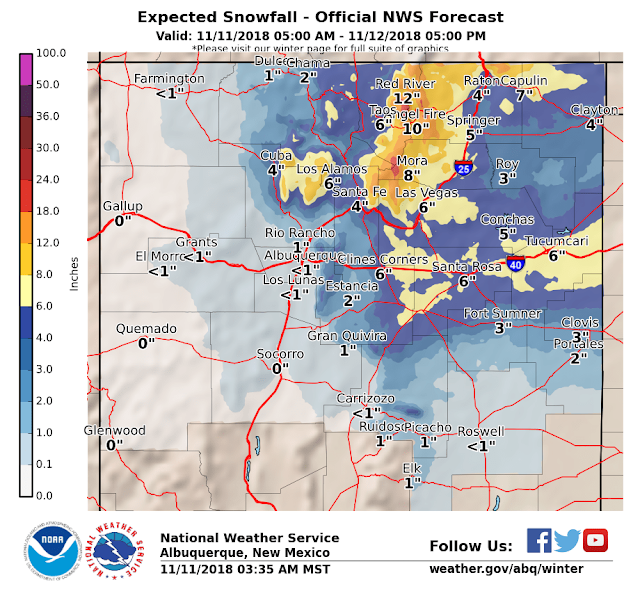 NWS Albuquerque Total Snowfall Forecast. (Click On The Link For The Latest Information). Current Winter Hazardous Weather Conditions. 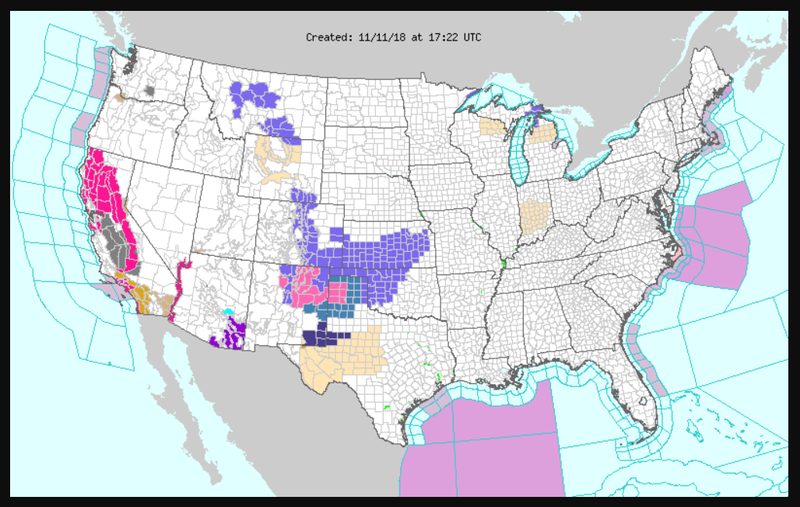 Winter Storm Warnings, Winter Storm Watches, & Hard Freeze Warnings Are In Effect For The Local Area. 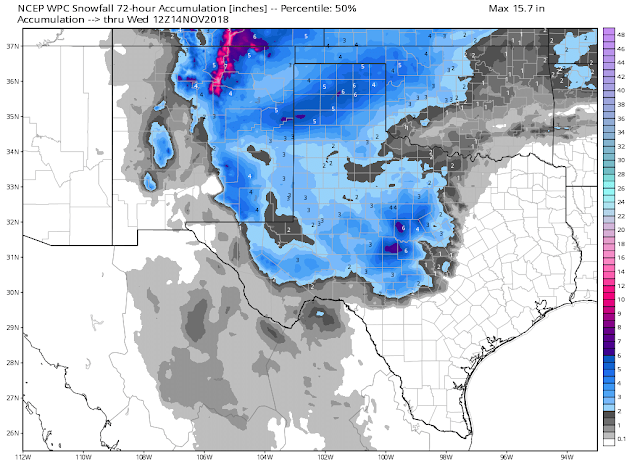 Weather Prediction Model (WPC) Total Snowfall Forecast. Valid Tonight Through 5 AM MST Wednesday. 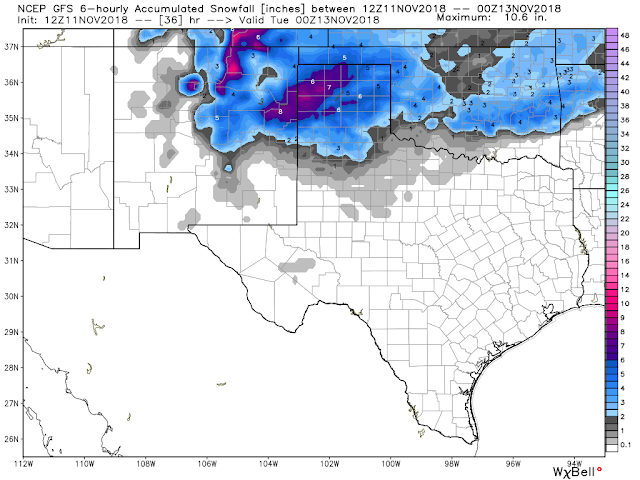 If you like and want snow this particular model offers the best hope for getting some on the ground. I'm a little puzzled by its persistent forecast for accumulating snowfall (locally 2" to 4") by the time the storm ends Monday night. 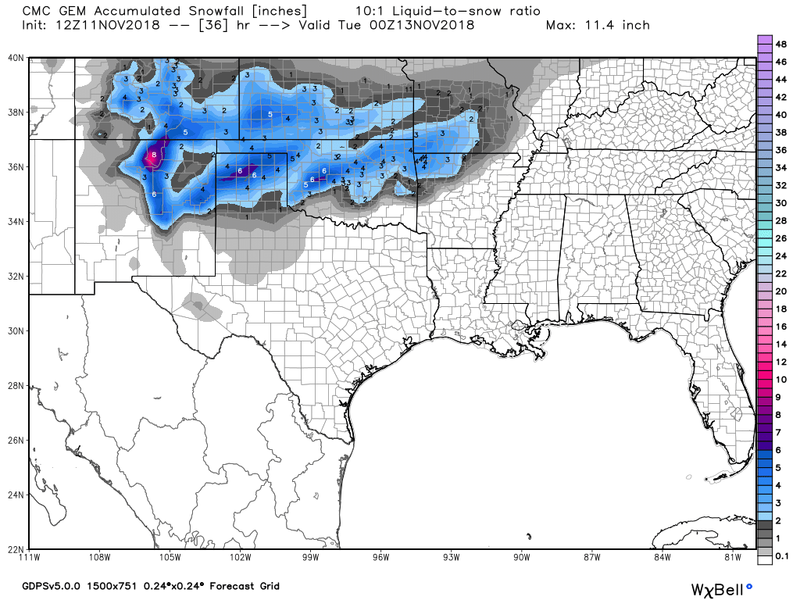 None of the other models are picking up on this and it is the outliner in the snowfall forecast. NWS NDFD Total Snowfall Forecast. Valid Today Through 5 PM MST Tuesday. 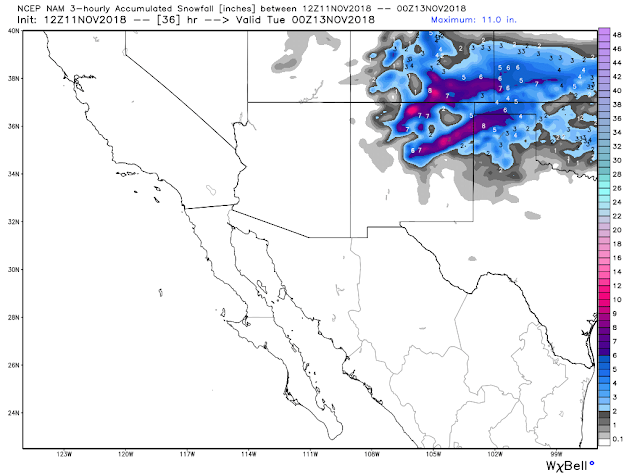 U.S. GFS Total Snowfall Forecast. Valid At 5 PM MST Monday. Canadian (GEM) Total Snowfall Forecast. There is a subtle trend in some of the model forecasts to bring the accumulating snowfall further south and west than earlier forecast. And heavier also. 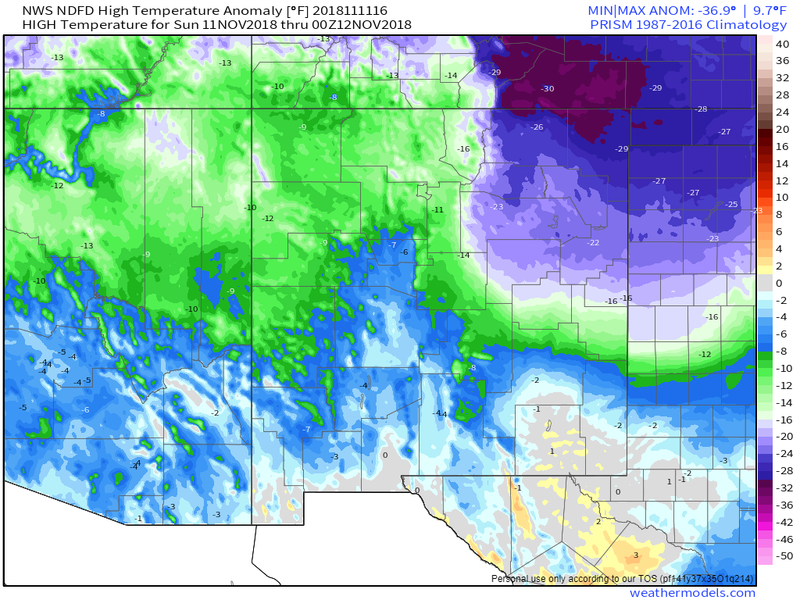 We nearly always play a tough and go game in New Mexico with winter storms. As I've talked about and mentioned for years the exact track that the mid and upper level storm takes makes all the difference in the world in who turns white and who does not. When I was a kid growing up in Artesia we would go to bed not expecting much from a storm only to wake up to find inches on the ground. Of course we've come a long ways in forecasting but occasionally mother nature loves to remind us that we don't always have her figured out. I expect to see surprises with this one too.